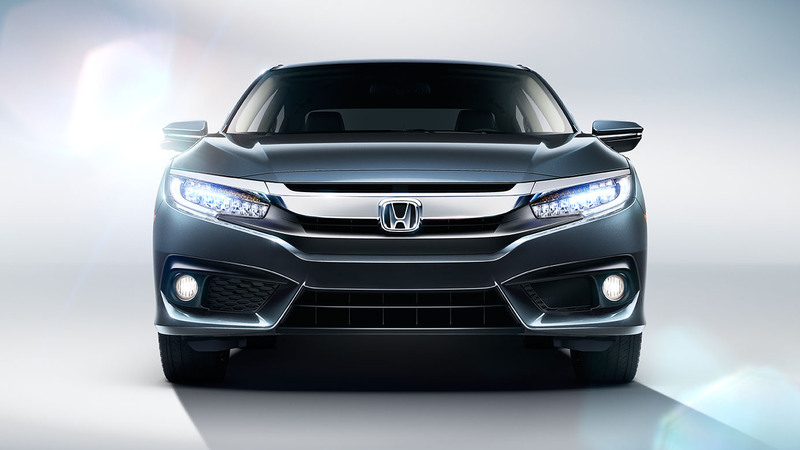 The 2016 Honda Civic is fully redesigned. For now, only the sedan and the mainstream trim levels are available. The coupe and a new four-door hatchback body style will arrive later in the model year, as will the high-performance Si and new Civic Type R. The Civic Hybrid and Natural Gas have been discontinued. The outgoing Honda Civic (2011-’15) generation garnered some very un-Honda-like controversy during its run, with lackluster early reviews leading to a virtually unprecedented second-year overhaul. Although that emergency surgery made the Civic more competitive, it failed to restore the car’s class-leading status. With rivals improving by leaps and bounds, the Civic just wasn’t a no-brainer pick like it used to be. For longtime Honda buyers, the fully redesigned, profoundly improved 2016 Honda Civic should come as a relief. From the Civic’s edgy yet upscale looks to its mature cabin (no more two-tiered dash!) with nifty touchscreen-based tech, it’s clear that Honda’s innovative spirit has been revived. There’s innovation under the hood, too, in the form of a new turbocharged 1.5-liter four-cylinder engine. A first for the Civic, this turbo mill, which is offered on the higher trim levels only, produces a strong 174 horsepower and yet earns an estimated 42 mpg highway. Less expensive Civics receive a new engine as well, a 2.0-liter four-cylinder that’s more powerful (158 hp) and fuel-efficient than the 1.8-liter it replaces. Like the best Civics of yore, the new one feels sporty and fun when you’re driving it on winding back roads. Unlike its predecessors, however, it’s fairly quiet inside at speed, and its ride is more compliant than ever. We generally take boasts like Honda’s “best-in-class interior volume” with a grain of salt, but in the new Civic’s case, it translates into so much rear passenger space that families might question the need for an Accord. The interior design and materials are laudable, too, approaching Acura-grade refinement in the top Touring trim. As noted, there are a lot of great choices for compact sedans these days. The Mazda 3 continues to distinguish itself with strong fuel economy, a sleek cabin and sporty handling, though its cramped backseat puts it at a disadvantage. The nimble and well-equipped Ford Focus may not be the freshest face, but this year’s model should rival the Civic for the latest in-car technology. For a less expensive but still well-rounded sedan, we certainly recommend trying the Kia Forte. Last but hardly least is the redesigned Chevrolet Cruze, which comes gunning for the Civic with styling that Honda may find distinctly flattering. To be sure, it’s going to be tough to choose this year. But if you’ve been waiting for the Honda Civic to get its groove back, consider your patience rewarded. 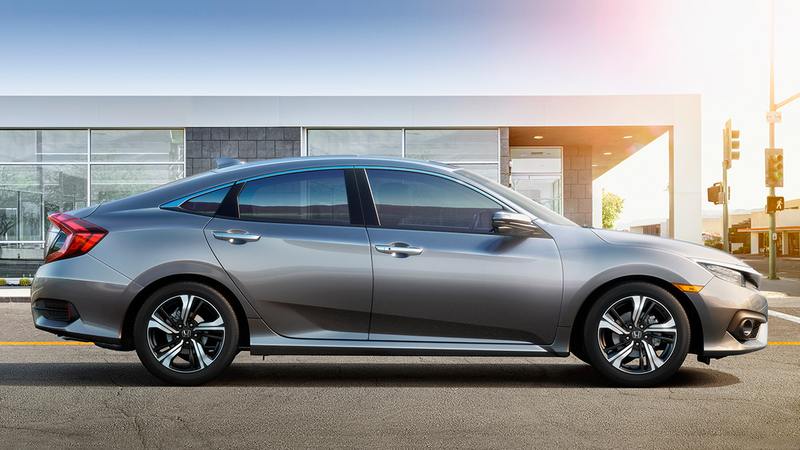 The 2016 Honda Civic is a compact car offered initially as a sedan, with coupe and hatchback styles to follow. The sedan is available in LX, EX, EX-T, EX-L and Touring trim levels. The EX adds 16-inch alloy wheels, a sunroof, heated side mirrors, variable intermittent wipers, keyless entry and ignition, a multifunction trip computer, a rear center armrest with cupholders, 60/40-split folding rear seatbacks, an eight-speaker audio system with dual USB ports, Honda’s camera-based LaneWatch lane-change assistant, dynamic guidelines for the rearview camera and a 7-inch touchscreen interface with Apple CarPlay, Android Auto, SMS voice-to-text functionality and smartphone-app integration (including app-based navigation). The front-wheel-drive 2016 Honda Civic comes with a four-cylinder engine, but the exact type varies depending on the trim level you pick. The LX and EX trims come with a 2.0-liter four rated at 158 hp and 138 pound-feet of torque. It’s paired to either a six-speed manual transmission (LX only) or a continuously variable transmission (CVT) that functions like an automatic. The CVT is optional on the LX. According to Honda, the LX manual should return 31 mpg combined (27 city/40 highway), while both trims with the CVT are pegged at an excellent 35 mpg combined (31/41). The EX-T, EX-L and Touring trims are powered by a turbocharged 1.5-liter four-cylinder rated at 174 hp and 162 lb-ft of torque. The CVT is the only available transmission. Fuel economy for the turbocharged Civics is actually slightly better, checking in at 35 mpg combined (31/42) across the board. The 2016 Honda Civic comes standard with stability control, antilock disc brakes (many previous Civics came with rear drums), front side airbags, side curtain airbags and a rearview camera. Starting with the EX trim, a right-side blind spot camera (LaneWatch) is also standard. 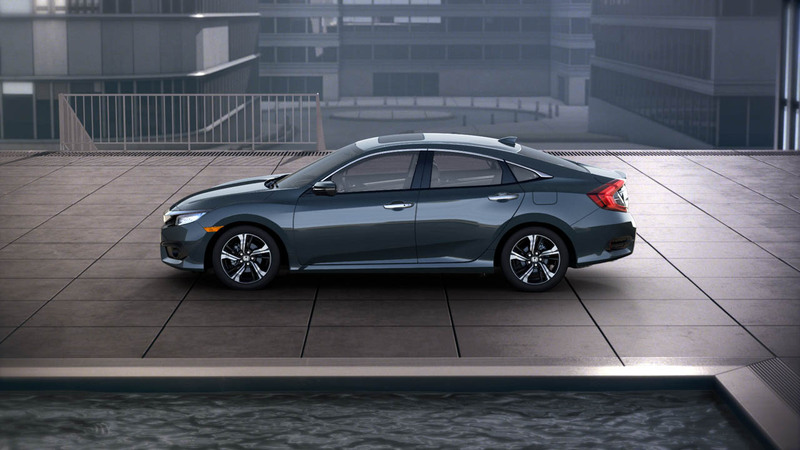 Standard on Touring and optional on other Civic sedans is the Honda Sensing safety package, which adds adaptive cruise control, lane-departure warning, lane-departure intervention and forward-collision alert with automatic emergency braking. The 2016 Civic sedan is about 3 inches longer and 2 inches wider than its predecessor, and its wheelbase is a bit longer, too. 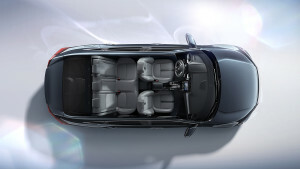 That means there should be more room for passengers, and indeed, Honda says the Civic has the most spacious interior in this class. Real-world testing sometimes calls bold claims like these into question, but make no mistake, this Civic is seriously roomy. Four 6-footers should be content to ride all day, which is an extraordinary achievement for a compact sedan, and that enhanced space should also be a boon to families using bulky child safety seats. From the driver’s vantage point, the new Civic feels like a luxury car compared to the outgoing model. Gone is the busy two-tiered dash, replaced by an elegantly restrained layout with upscale materials for the segment. Thoughtful touches abound, such as a capacitive-touch volume button on the steering wheel that works well whether you slide your thumb across its ribs or click either end like a rocker switch. A responsive 7-inch touchscreen comes standard in all trims but the base LX, and it includes both Apple CarPlay and Android Auto for full-fledged smartphone functionality via the touchscreen itself. In terms of storage, there’s an unusually deep storage bin under the center console’s armrest with 7.2 liters of capacity — enough, says Honda, for multiple iPads or a large water bottle. Trunk space, meanwhile, has shot up in the new Civic sedan, expanding from 12.5 cubic feet last year (an average figure) to a whopping 15.1 cubes. That’s true family-sedan territory. Note that the Touring’s trunk drops to 14.7 cubic feet due to the premium sound system’s subwoofer. The 2016 Honda Civic has a sharpness on the road that’s been absent in recent years. Steering response is lively, and there’s notably less body roll than in the previous Civic. At the same time, the ride is eminently comfortable, and there’s less noise inside than Civic drivers have come to expect. When you’re accelerating hard from a stop or passing other vehicles, the base 2.0-liter engine can feel sluggish when paired with the CVT, but for normal driving it’s capable enough. As for the 1.5-liter turbocharged engine, its healthier midrange punch means it’s not working as hard as the 2.0-liter most of the time, so the CVT makes for a better pairing here. Honda eschews any sort of manual mode for the transmission, instead providing a Sport mode that essentially just boosts engine speed a bit to make the turbo’s sweet spot more accessible. Either way, acceleration is spirited, and the turbo Civic keeps pulling at highway speeds like a more expensive car. Overall, this is one of the best powertrains in the class, offering the fuel efficiency of an economy model and the performance of a sporty one.